Obviously, this roll is called “Carburetor” because it looks like one. What, you can’t see it? No, wait… look at it this way… turn your head just like this… see it now? No? Darn. Oh well, I can’t quite see it either. But I’d assume that’s why it’s named Carburetor. Meh, who knows. What do I know about cars and engines and such? (The correct answer is, nothing.) It is, however, a delicious roll and very pretty to look at! I got the idea for this roll from the Tex Wasabi’s menu. Bake the tempura shrimp according to the directions on the package, or make your own. 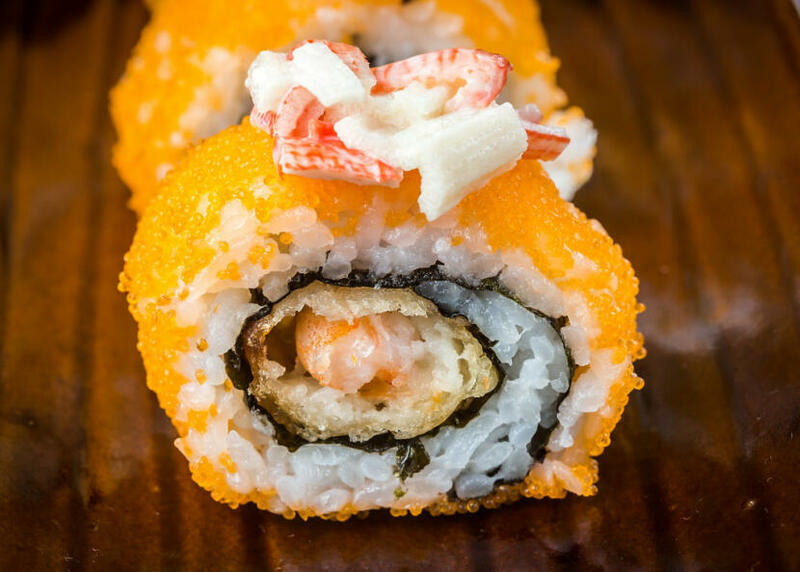 Roll the sushi inside-out, using two pieces of tempura shrimp as your fillings. Roll the sushi roll in tobiko, coating well. Slice the sushi, and pile a small amount of the imitation crab mix on each slice. Alex, you could just toast some white or black sesame seeds (or both) and roll the outside of the roll in that instead. 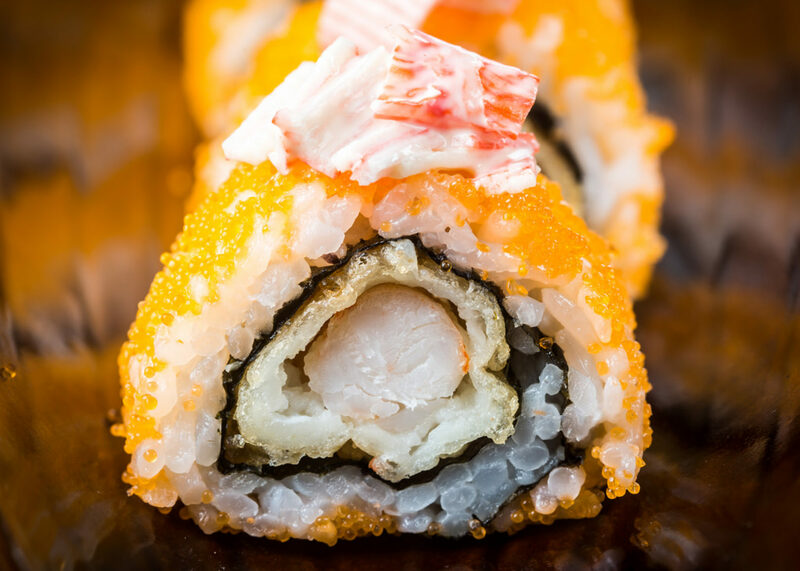 But you should give the tobiko or masago eggs a try. They’re not as ‘fishy’ as real caviar (sturgeon) or salmon eggs. These are some yummy lookin’ rolls. Lovely photos. Lara – Ah, good point. I’ve never had caviar, so I didn’t realize fishiness would be an issue. Looks great. How did you get the crab in slices like that? Yes that makes total sense, I thought about doing that last time but I think I had too many drinks by then. Thanks for all the recipes, helps out a lot. Made ten rolls for last sushi party, talk about being tired! I don’t see a carburetor either… But it looks delicious! Darrell – Note that this is imitation crab that I’m using, NOT real crab. 😉 So glad to hear you found all my recipes helpful! Yes, I tried the real crab once in a california roll….was not good. Current favorite is raw tuna…YUM.